A seafood classic is made even more decadent by using browned butter! 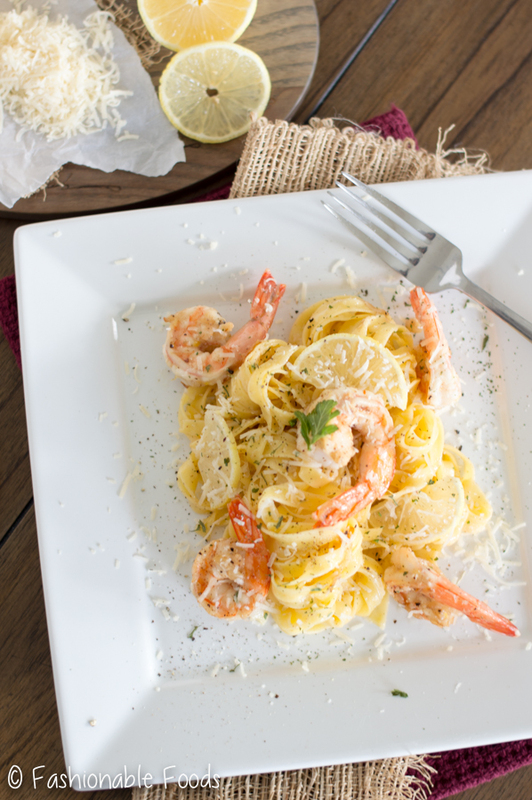 If you love shrimp scampi you just have to try my brown butter version! Welcome to a new week, my friends. How was your Daylight Saving Time adjustment? I’m a huge fan of the time change, so I’m all good. That extra daylight in the evening makes me happy to know that Spring is on it’s way! If you’re in the north, I hope you’re safe and warm from the blizzard. Thankfully, we are just experiencing rain here… and some intense wind. Hopefully this is the end of winter until next year, but you never know what Mother Nature is going to do, right? I mean, we went from 70º days in February to a blizzard in March. I’d say anything is possible. Enough weather talk, who wants some shrimp scampi? ?? 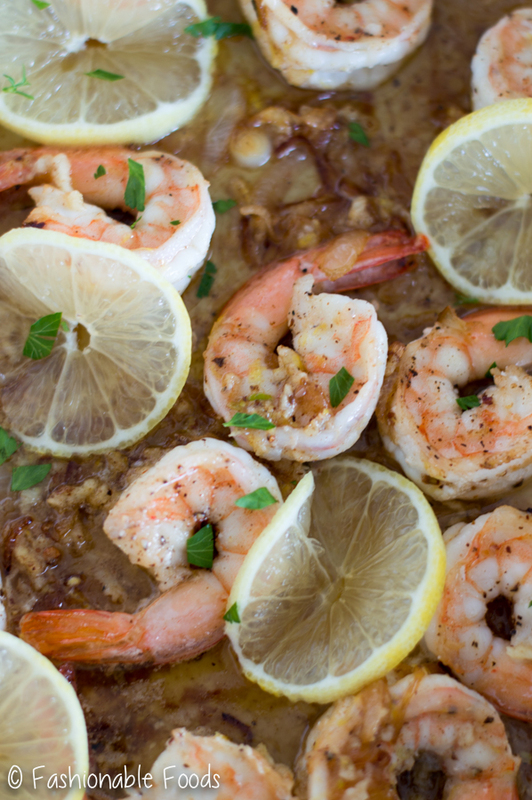 I’m obsessed with brown butter, and it’s downright fabulous when mixed with shallots, garlic, white wine, lemon, and shrimp. Mouth watering good. Can’t sleep cuz you’re thinking about it good. I really struggled to not eat the entire pan of this. Like, really struggled. Meaning, take a photo then take a bite. Repeat. Repeat. Repeat. We’re lucky I got enough photos… otherwise I’d have had to make it again. And that would have been a shame. ? You know what IS a shame? 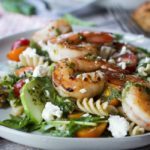 Looking at this mouth-watering shrimp scampi with BROWN BUTTER and not being able to run in the kitchen and make it. Kyle and I are doing a round of Whole30 for the month of March. ? If you were around for my last Whole30 experience, you know it didn’t go so well. I had my issues with it, but I still decided to give it another go. I’ll go into more detail about the why in a post once we are done. I will say it’s going much better this time, but I think that’s because I actually have a reason to do a Whole3o, where before I really didn’t. 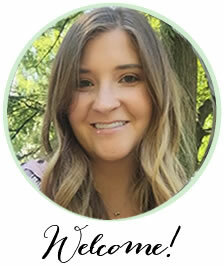 Let’s be thankful that I made and shot this recipe long before we started Whole30! Anyway, if you ever made shrimp scampi, you’ll know how easy it is. For this version, you just want to brown the butter. 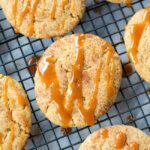 Nutty browned butter = pure heaven. I served mine over fresh pasta, but you can use dried pasta, rice, risotto, or just serve it alongside some veggies and a salad. 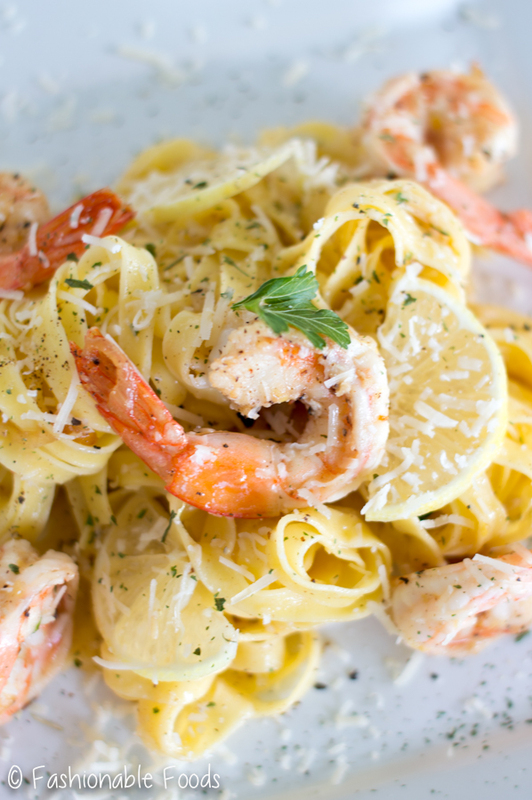 Now, go brown some butter… I guarantee you won’t be able to resist this shrimp scampi! ? Meanwhile, lay the shrimp out on a plate lined with paper towels and pat them very dry. In a bowl, toss the shrimp liberally with salt, pepper, and then add a pinch of red pepper flakes if desired. Heat the olive oil in a large skillet over high heat. Once the pan is hot, add the shrimp in and cook for about a minute and a half on each side. Reserve the shrimp on a plate and set aside. Turn the heat to low and add the butter. Once it melts it will start to bubble and then once the bubbling subsides, keep a close eye on it. You want the butter to be a nice golden brown, but not burned! Once it’s golden, add in the shallots and garlic and sauté for a minute or so until fragrant and soft. Add in the lemon zest, juice, and white wine. Let the sauce simmer for about 2-3 minutes, or until it reduces a bit. At this point, the pot of water should be at a rolling boil. Salt it well and drop the fresh pasta. Cook for 2-3 minutes. Reserve some pasta water and then drain and rinse with hot water. Only rinse if you’re using gluten-free pasta! Regular wheat pasta should not be rinsed. 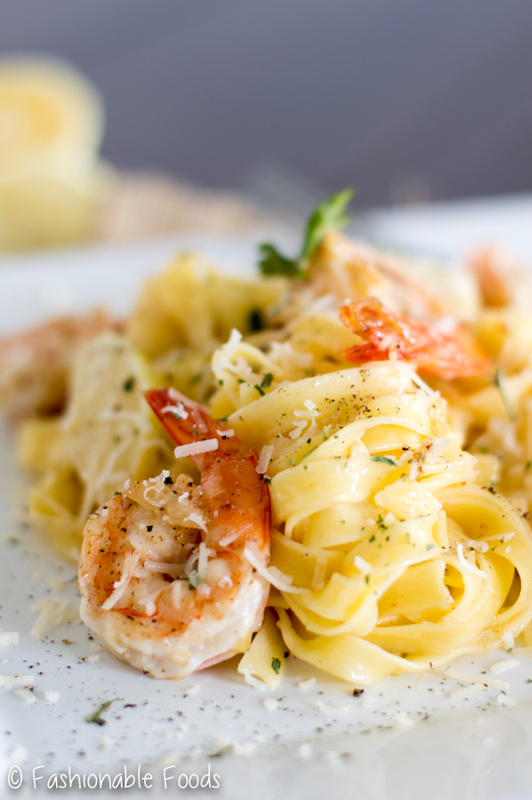 Toss the pasta with the sauce and the shrimp. Stir in the parsley and if needed, add some pasta water. 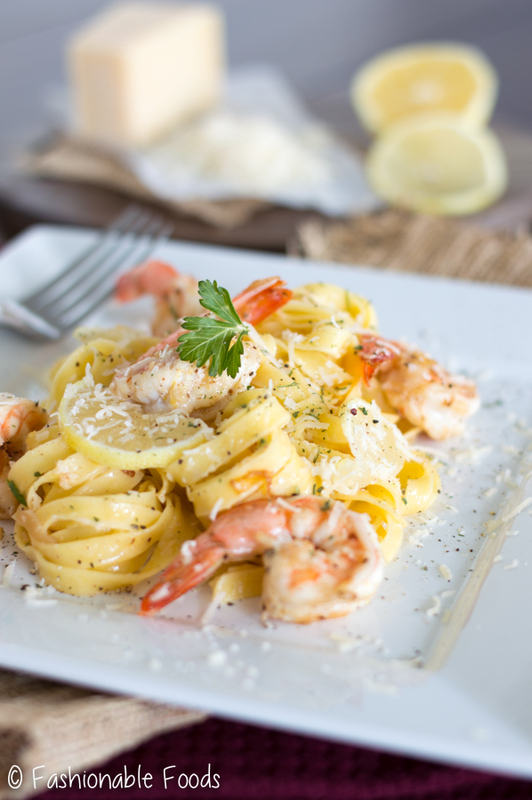 Divide the shrimp scampi among 4 serving dishes. Top with parmigiano cheese and a drizzle of olive oil and serve! *The same amount (in weight) of dried pasta can be used. This goes for gluten-free or regular wheat pasta. Use whatever you like! What a fantastic and delicious looking dish, Keri. 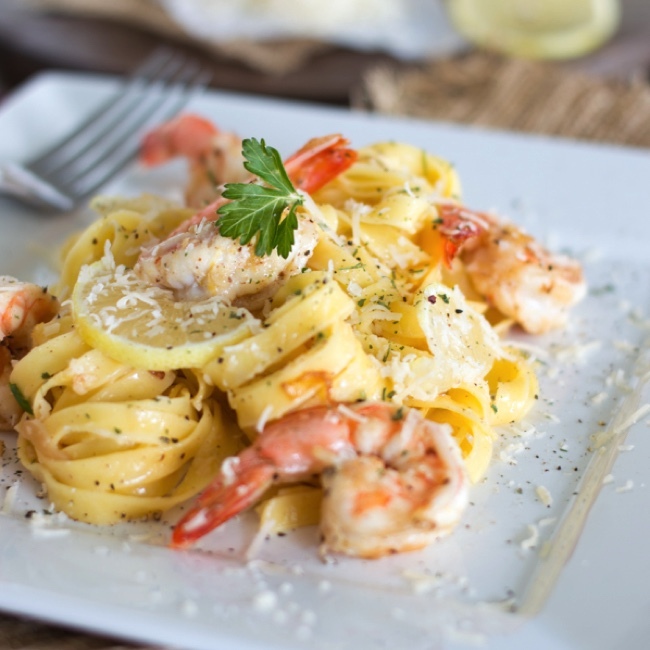 My husband loves seafood and this shrimp scampi looks indeed classic. 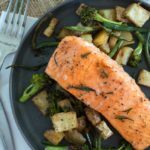 Absolutely loved the idea of adding browned butter to this! I am sure he would go gaga over this. Thanks for this lovely share.